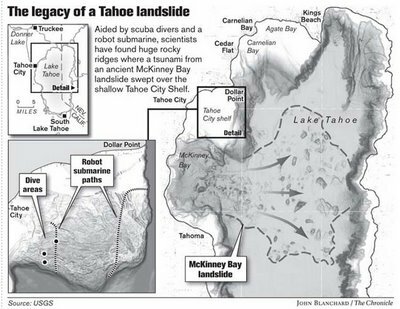 This recent article in the San Francisco Chronicle discusses some geologic research that indicates there was a massive underwater landslide in the ancestral Lake Tahoe sometime between 8,000 and 15,000 years ago. This slide, possibly triggered by an earthquake, created a tsunami that, if it happened today, would flood the low-lying populated areas. Keep this in mind if you’re planning a ski vacation to Tahoe!